We all get older… every day. Am I stating the obvious here? Well, I’m about to go against an entire industry and what the gurus would have you believe. No matter what they say, there’s no way to “stop aging” or even slow it down! We are biological creatures. And at this time we’re still subject to natural laws, no matter if we like it or not. However, there are ways to turns the aging process into a more positive and enjoyable experience. Getting older doesn’t have to mean living with pain, suffering, and loss of function. But here is the clincher… there is a price to pay! If you want to stay healthy and fit, you must stay active, eat well, and get some exercise. There’s just no way around it! As you get older, it becomes more important to stay fit. Learning to make exercise a part of your daily life is the key to living longer and happier. There is no better time than now to start being active and learning what it means to be fit. This is what makes a gym an ideal place for seniors (here’s that word again!). And that’s why we older and wiser folk, aka “seniors,” might want to join a gym. So let’s take a look at the top seven reasons you may want to join a gym. As you get older, you start to lose bone density, putting you in danger of developing osteoporosis. Osteoporosis is a disease causing bones to become brittle and weak. People with osteoporosis are at greater risk for fractures. Luckily exercise has been shown to increase bone density and strength; but not just any exercise. The best type of exercise for your bones is resistance exercise, including lifting weights and weight-bearing exercise, such as walking. So put on your tennis shoes and start walking, at least a few times per week. And for an extra thrill, put a backpack filled with books on your back, to add some extra weight and resistance. When you do that, you take care of both, weight-bearing and resistance exercise. Cardiovascular activity is a great way to keep your heart healthy and to manage your weight. Walking, speed walking and running are ideal exercises to accomplish this. But it’s not always easy or feasible to do this outside all year round. A gym offers you treadmills and stair climbers that can be used no matter what the weather outside is doing. After the age of 40, we all start to lose muscle mass. However, through staying active and working out, you can slow down the loss of muscle. Lifting weights is a good way to maintain muscles mass, and a gym has all the equipment that you will need. Most gyms have Yoga classes specifically tailored to seniors. A yoga class will help you stay flexible by teaching you proper ways to stretch. Flexibility is one of the most important aspects of health. Stretching also helps your blood vessels stay flexible, which helps your body absorb more nutrients. Maintaining balance is vital for seniors. A fall can be disabling and could cause permanent damage; they are the leading cause of injury in seniors. By performing balance exercises, you put the odds of avoiding falls in your favor. As we’re getting older, being able to maintain our independence takes on an entirely new meaning. Staying fit and active ensures (within reason) that you’ll be able to continue your normal daily activities. A regular exercise routine could help you avoid developing conditions that may cause you to become dependent on others. Staying independent of needing help or assistance is a great motivation to stay healthy; it certainly is for me. Gyms are great places to get help and knowledge about exercise and staying fit. The people that work at gyms can guide you and help to make sure you are doing the exercises correctly. Having a spotter or personal trainer can help you to maximize your work out and ensure you don’t hurt yourself. That’s why most gyms offer a wide variety of classes. Depending on the type of gym, many of these classes are specifically designed with older adults in mind. Some will prefer the company of their peers, while others prefer to work out with all types of people and all age groups. Whatever your preference, most classes are taught by trained professionals that are there to help and guide you. This makes it easy to learn a new exercise routine without getting hurt or lost in the details. While this is not the primary reason for going to the gym, it’s a nice side benefit. You will be able to socialize and interact with your peers if you choose so. It’s a lot easier to keep a regular exercise routine if you have friends that are doing the same thing as you. Many people, of all ages, go to classes together. They exercise together, share experiences, socialize, and develop new friendships. 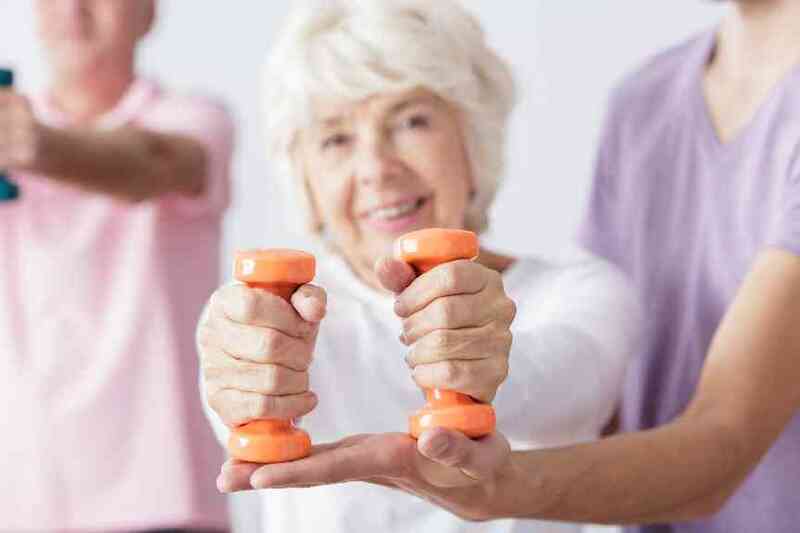 Gyms know what exercises older people need to maintain a healthy lifestyle. And today, many are catering to us, the older population. They provide classes and offer their expertise to help us achieve our health goals. So let’s get to the gym, enjoy ourselves, and celebrate the journey!